Slime balls sneezed by baby pandas can't be picked up by the player or hoppers. 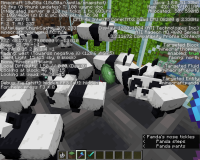 Active the command block, stop it when there are 300 baby pandas. Wait, till a baby panda sneezes a slime ball.